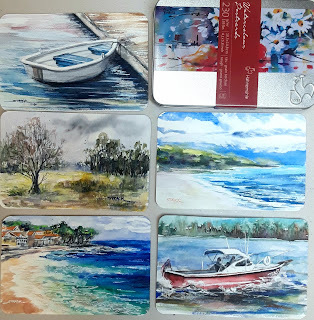 Annie Strack news: Watercolor Postcards from Hahnemuhle. I've been playing around with some watercolor postcards from Hahnemuehle, and I'm hooked! 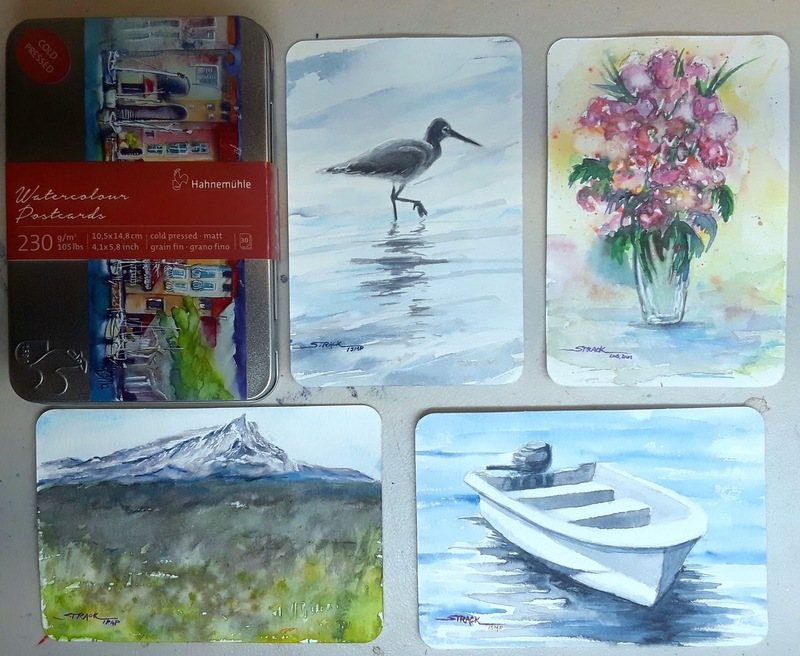 These 4x6 papers come in adorable collectible tins, and are just the right size to tuck into a pocket or purse to keep on hand for painting on the go. The paper comes in a choice of two surfaces, Cold Pressed and Rough. 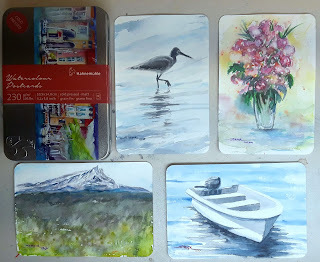 I keep one tin in my car along with a tin of watercolors and a couple of pocket brushes, for when the mood strikes! The Cold Pressed paper is fairly smooth and soft, and lightly sized. The watercolor paints soak in and leave soft edges, and yet colors lift fairly well. The paper has very little texture, allowing for finer details when painting. The Rough paper has quite a lot of texture. The texture is also very patterned, resembling a woven linen finish. The paper is marvelous for anyone wanting a coarser surface to create texture in their paintings. I used both papers with watercolors, ink pens, and masking fluid. The papers held up to heavy washes, although curled when wet. They also withstood my heavy-handed corrections -- lot's of erasing while drawing, and lots of lifting while painting (nobody's perfect, least of all, me). All in all, I really like the postcard paper, and I'll be using more of it in the future. Annie, your paintings are gorgeous! I love Hahnemühle's watercolour postcards. They're so handy and wonderful to work on.